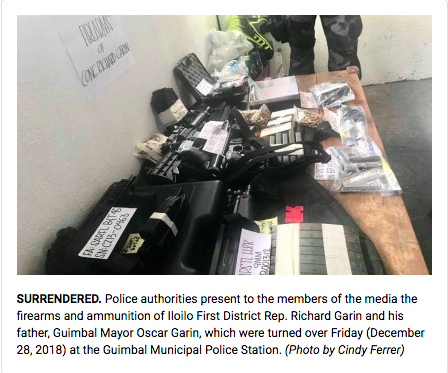 The firearms and ammunition of Iloilo First District Representative Richard Garin and his father, Guimbal Mayor Oscar Garin, were already turned over to the Guimbal Municipal Police Station on Friday. Guimbal Vice-Governor Christine Garin personally brought the firearms on behalf of his father and brother to the police authorities around 9:30 a.m, Senior Supt. Marlon Tayaba, director of the Iloilo Police Provincial Office (IPPO), said in an interview. The Garins turned over a total of 14 out of the 19 firearms listed on the information database of the Philippine National Police (PNP), Tayaba said. “It is a good gesture, at least they have submitted these firearms as to the order of chief PNP,” he said. The turn-over of firearms of the Garins came a day after PNP Chief, Director General Oscar Albayalde, ordered the cancellation of all their gun permits and licenses. Albayalde was prompted to cancel all the Permits to Carry Firearms outside of Residence (PTCFOR) and License to Own and Possess Firearms (LTOPF) issued by the PNP to the two officials following their alleged mauling and abuse of a police officer last December 26. Based on the database, it indicated that Rep. Garin is the registered owner of 11 firearms, three of which have expired licenses, while Mayor Garin is the registered owner of eight firearms, five of which have expired licenses. Rep. Garin turned over nine out of the 11 firearms, four of them are long firearms and five are short, Tayaba said. “They are still exerting effort to know the whereabouts of these firearms, and I advised Vice Governor Garin that if these are in Manila, they can turn it over to the nearest police stations,” he said. For Mayor Garin, Tayaba said that five out of the eight firearms were surrendered, one is a long and four are short firearms. Tayaba said three other firearms of the mayor were lost two years ago, and they are covered by a police report. Tayaba said they have received reports that Rep. Garin and the mayor left their hometown, but police are unaware of their destinations. As of the moment, Tayaba said that they have already turned over all the surrendered firearms to the Regional Civil Security Unit of the Police Regional Office 6 (Western Visayas). In a follow-up media interview, Vice Governor Garin said she turned over the firearms as a “promise” to Tayaba. “When we heard about the pronouncement of chief PNP, I asked him (Tayaba) to give my family time to gather all these firearms so they will be turned over,” she said. She claimed initiating the surrender of the firearms because she is also “part of the family” and they are willing to help. However, the vice governor said that she does not have idea where her father and brother are because she have not talked to them for a while.